We are located at 185 East Oak Street in Globe, AZ. This is behind the Arts Center in Globe and not far from the Post Office. We are on the corner of Hill and Oak Streets. Come join us for worship services at 8 am and 10 am. 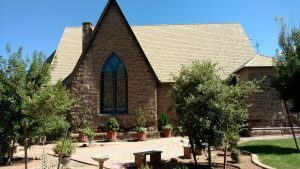 You may also come by the church throughout the week to spend time in our peaceful gardens located on each side of the church.